High end lubricant for highly stressed gears in modelling applications.Specially suitable for gears of model helicopters, RC cars, trucks, model railways and servos. Also applicable for axles and bearing systems in any modelling application. 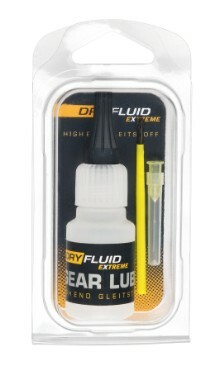 A long-lasting lubrication effect is achieved using dry particles, sliding polymers and high end sliding fluids. It is extreme pressure-resistant and has an excellent adhesive force. DyrFluid has minimal dust and dirt adhesion. It includes a pinpoint dispenser and a separate fine cannula for a very precise application, as well as a fine hair paintbrush for surface applications.